Botswana is a landlocked country in Southern Africa about the size of Madagascar. Famous in the jewellery trade for its high-grade diamond ores and rich kimberlite pipes; Botswana is equally well-endowed in the ‘Big Five’ safari circuit. After all, this is where the Okavango River winds down from Angola and soaks up in the sands to form the wildlife magnet, Okavango Delta, in the heart of semi-arid Kalahari Basin which makes up almost 85% of the country’s land area. Botswana’s high-price/low numbers approach to tourism and the abundance of wildlife in vast swathes of national parks and game reserves make it a perfect destination by Botswana 4WD camper rental in Africa from Britz Motorhome Rentals or Caprivi Car Rentals. 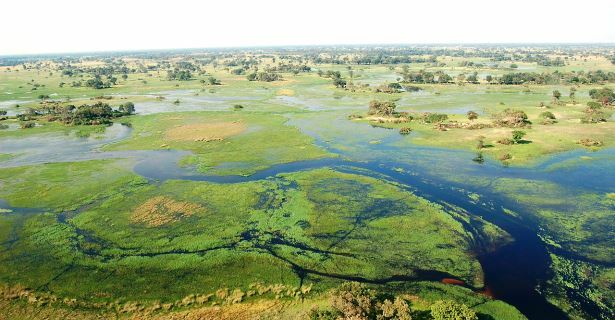 The most sought-after destination by 4WD campervan hire in Botswana is the Okavango Delta; one of the largest inland deltas in the world. Known as the ’jewel of the Kalahari’, because of the volume of life it supports in an otherwise semi-arid landscape; the fan-shaped delta in the country’s northwest region swells up to three times its normal volume when the floodwaters from the Angolan highlands, where the Okavango River begins, spills over. Black and white rhinoceros have been reintroduced to join the teeming population of the community-established Moremi Game Reserve (occupying the central and eastern portion of the Okavango Delta) which includes almost 500 species of birds, and large concentrations of the African wild dog, buffalo, lion, giraffe, leopard, cheetah, hyena, impala and the water-loving lechwe. This makes spotting the ‘Big Five’ – Cape buffalo, African elephant, lion, leopard and rhinoceros – easier in a self-guided game drive by 4×4 campervan hire in Botswana. You can combine both the Moremi and the Chobe National Park, immediately north, in your Botswana 4WD campervan rentals safari adventure. Chobe River, which borders the park to the north, is most famous for herds of Cape buffalo and elephants drinking its waters during the dry winter months. It also forms the tri-country border among Botswana, Zambia and Zimbabwe that makes crossing into Victoria Falls faster. Botswana has markedly different (wet) summers and (dry) winters. Summers run from October to April and can be very hot; with daytime temperatures reaching up to 40°C and rains making sandy roads impassable. Rains also disperse wildlife, so sightings can be less predictable. This makes travel by 4×4 camper rental in Botswana more bearable in winter; which runs from early May to late August, when days are clear, sunny and warm and nights are cooler. This is also the time of the year when wildlife never wanders far from water sources; increasing your chances of ticking off the Big Five and sighting a multitude of other wildlife. To experience the immensity of the Kalahari Desert; a safari adventure by Botswana 4×4 campervan rental in the 52,800-square-kilometre Central Kalahari Game Reserve is in order. More easily accessed by Botswana 4WD campervan hire in Gaborone, the country’s capital, the game reserve is 430 miles northwest. Whether you come after the summer rains or during the dry winters; this huge patch of ‘Kgalagadi’ (land of the thirst) beckons with untouched wilderness that seemingly stretches interminably, and flat grasslands punctuated by dwarfed trees and teeming with massive herds of springbok, giraffe, wildebeest, hartebeest and eland. The Kgalagadi Transfrontier Park, just 350 miles southwest and an equally popular destination among travellers by Botswana 4WD camper rental; is a land of red dunes and scrubs fading into infinity and populated with concentrations of Gemsbok.